IDW Publishing have a new hardcover collection out of truly rare comic strips. From their web site: “After more than 80 years—the complete Silly Symphony newspaper strips are collected in English for the first time ever! The artwork for these rare strips has come straight from the Disney vaults. Each page has been meticulously colored using as a guide the original bound file copies that belonged to Walt Disney himself! 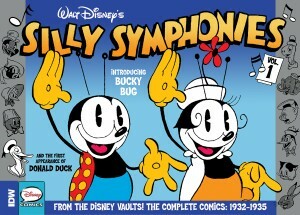 This first of four volumes includes all the strips featuring Bucky Bug, the first Disney character to be originated in newspaper comics. The book also includes the very first Donald Duck newspaper strip—an adaptation of The Wise Little Hen. Other classic adaptations are Birds of a Feather, Penguin Isle, The Boarding School Mystery, The Robber Kitten, and Cookieland.” Also, Westfield Comics has an interview with Bruce Canwell, associate editor at IDW. What else may be locked away in their vaults? Perhaps we should count ourselves lucky if we never find out. Some things were not meant to be seen by man, nor beast. In b4 someone finds all those illicit drawings people made behind Walt's back of the princesses (and bambi) and something under the "Cinemax" brand releases the clips and artwork for $$$, digital and print!